Inspection reports for the two circuses licensed to use wild animals in Britain – and obtained under the Freedom of Information Act by ADI – have revealed how issues repeatedly raised by inspectors are not being addressed, highlighting the urgent need for a ban. The revelations of how circus animals are being failed are sadly not surprising to ADI but we hope this latest evidence, which just scratches the surface of what these animals endure, will quash any doubts about the inevitable suffering and the unnatural lives these animals lead. The release of the inspection reports comes ahead of the Second Reading of the bill introduced by Jim Fitzpatrick MP to ban wild animals in circuses on Friday 17 October. Three snakes had been allowed to get to an “advanced” state of putrefaction, preventing a post-mortem examination to determine their cause of death. Tests on the remaining snakes identified A Salmonella, Clostridia and E Coli bacteria, with the probable cause of death Clostridial Septicaemia. Despite the circus having been advised to provide water for animals in the pre-performance holding area, this has repeatedly not been provided. Additionally, water for the tigers to bathe in was withheld, denying them the ability to perform this natural behaviour, albeit in a small tub of water. Veterinary records were found to be incomplete for the fox, raccoon and snakes, and vets paperwork was missing for a tuberculosis test for the ankole – a type of African cow. Humidity readings for the snake vivarium were also not recorded. Previously released documents revealed that the dates of birth for 12 of the 15 animals – fox, raccoon, snakes and reindeer – are apparently unknown. Owing in part to the animals being insufficiently trained, inspectors have repeatedly had difficulties reading the big cats’ microchips, leading them to rely on photographs for identification – indeed it was noted that the microchips had not been read since the animals had been acquired. The raccoon’s enclosure size was noted, as previously, as being “only just acceptable”. The largest snake was also unable to fully extend its body and a branch was recommended and fitted in the vivarium to allow the animal to do so. Despite recent evidence from ADI of llamas tethered in full view of the big cats, inspectors found that “No susceptible prey animals were in view of the big cats”. This shows how the inspection regime cannot provide a candid picture of life for the animals in the circus and fails to protect them. ADI has revealed incidents of abuse that were missed by inspections and exposed instances where circuses have purposely duped inspectors by hiding elephant leg chains and even a severely injured lioness. A camel suffering from a recurring wound on her hock and the reindeer showing signs of ‘significant pruritis’, causing distress and coat loss. A previous inspection found one of the camels had “mange-like legions on both hind legs” and that both of the camels appeared to be infertile. A zebra kept next to a pony, following the death of their companion. Although members of the same biological family, the two are different species with different needs and are unnatural companions. A previous inspection report revealed that the reindeer have been castrated, and so cannot naturally shed their antlers. Hormone injections are administered to encourage them to shed, but these “can incite aggression”. The circus was advised to separate the animals to avoid further fighting. Politicians have the power to bring about change for wild animals in circuses by supporting the bill to ban wild animals in circuses on Friday. Please urge them to do the right thing by the public and, more importantly, the animals. TAKE ACTION FOR CIRCUS ANIMALS IN BRITAIN! 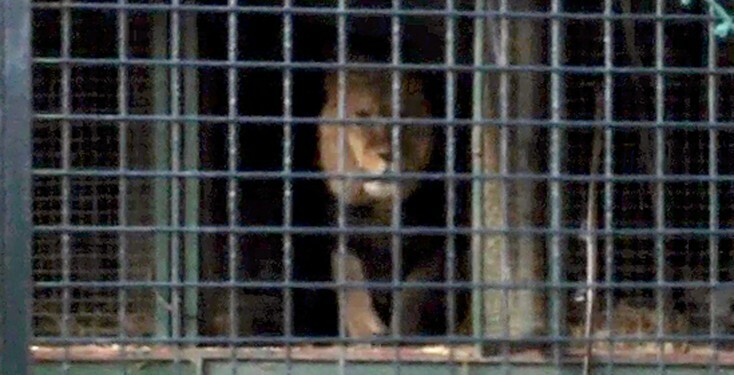 NO WILD ANIMALS SHOULD BE CAGED AND ABUSED!!! BAN THIS NOW!!! Please ban animals used for entertainment in circuses as they are tortured daily!! This abuse should be illegal and the perpetrators punished! Stop this suffering and living in captivity! Please ban wild animals in circuses. Wild life belongs in the wild. They are born to be free & need to be free. Them being used for entertainment is wrong & unnatural. There’s no place for animals in circuses. Times have changed. Please end the suffering for those that are still made to perform. Let’s bring up our children with respect for animals. It is shameful that we keep using and abusing animals for entertainment. Circus’s are cruel and out dated form of entertainment. There is no need for it any more. We need to be more in control of these animals, we need to take them away until they can show all of there paper work and ban all circus animals we need to move with the times and say enough is enough. NO to performing animals. The treatment of these animals is inhumane & abusive. This is beyond horrific!! These animals have the right to good lives, not to be held captive for entertainment. They should be returned where they belong, in the wild! It’s so absurd that people feel the need to keep animals in cages. This has been dragging on long enough and a ban on animals in circus is long overdue. Animals should not live in tiny travel cages being forced to do unnatural tricks. The majority of the electrate want it banned. Please ensure it is withoiut delay. this outrage must be stopped, morally ethically and totally.